This is a California-approved Firearm Safety Device that meets the requirements of Penal Code section 23655 and the regulations issued there under. Electronic lock includes a drill resistant, hardened steel plate behind the lock for greater security. 2 backup key is included. Batteries are accessible from the front of the safe and are easy to replace. 2-Way locking with 3 - 1" steel live action locking bolts and 3 dead bolts for 6 locking points. Safe holds 3 rifles & 4 pistols (built in pistol barrel rest) plus top shelve for storage. Biometric lock includes a drill resistant, hardened steel plate behind the lock for greater security. 2 backup key is included. Batteries are accessible from the front of the safe and are easy to replace. Biometric Lock store up to 20 fingerprints. This is a California-approved Firearm Safety Device that meets the requirements of Penal Code section 23655 and the regulations issued thereunder. Electronic lock includes a drill resistant, hardened steel plate behind the lock for greater security. A backup key is included. Batteries are accessible from the front of the safe and are easy to replace. 2-Way locking with 3 - 1" steel live action locking bolts and 2 dead bolts for 5 locking points. Safe holds 8 firearms up to 52" tall. Includes a removable shelf and fully carpeted interior. Safe holds 14 firearms up to 52" tall, or 7 firearms and storage, or all storage. 4 Adjustable shelves and fully carpeted interior included. This is a California-approved Firearm Safety Device that meets the requirements of Penal Code section 23655 and the regulations issued there under. Electronic lock includes a drill resistant, hardened steel plate behind the lock for greater security. A backup key is included. Batteries are accessible from the front of the safe and are easy to replace. 2-Way locking with 3 - 1.5" steel live action locking bolts and 2 dead bolts for 5 locking points. Safe holds 18 firearms up to 52" tall, or 7 firearms and storage, or all storage. Door Storage, 3 Adjustable shelves and fully carpeted interior included. Rugged Gun Safes, like its name are strong, tough, and an exceptional value. 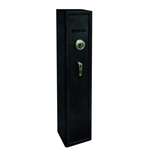 All Rugged Gun Safes are UL R.S.C. rated, exceed California DOJ requirements, and have a minimum of 30 minutes fire rating @ 1400 degree (up to 1 hour fire rating on Elite Series). Safe holds 24 firearms up to 52" tall, or 12 firearms and storage, or all storage. Door Storage, 3 Adjustable shelves and fully carpeted interior included. Backlit Electronic lock includes a drill resistant, hardened steel plate behind the lock for greater security. 2 backup key is included. Batteries are accessible from the front of the safe and are easy to replace. 4-Way locking with 5 - 1.5" steel live action locking bolts and 3 dead bolts for 8 locking points. Safe holds 24 firearms up to 56" tall, or 12 firearms and storage, or all storage. RealTree Door Storage, 5 Adjustable shelves, fully brown carpeted interior included. Lifetime Warranty against Burglary, Fire Damage. Water resistant for up to 2 feet of water for 72 hours. Safe holds 22 firearms up to 55" tall, or 11 firearms and storage, or all storage. Door Storage, 4 Adjustable shelves, fully carpeted interior included, leatherette trim around barrel rest, and built in 110V electrical outlet. Lifetime Warranty against Burglary, Fire Damage, and Water damage.